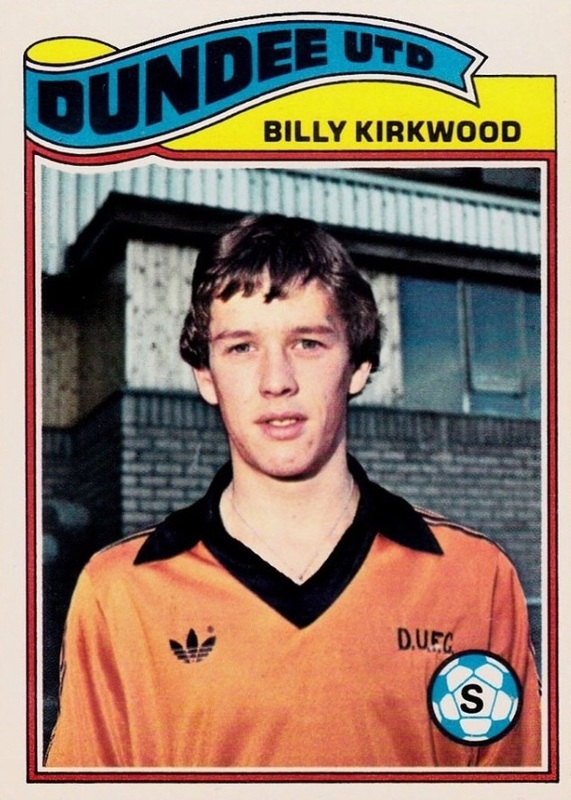 Billy was initially signed provisionally in May 1975 from Cornbank Boys Club and he began his career at United as an attacker. He started playing in United reserves in August 1976 and made his first appearance at first team level as a substitute in Iain McDonald's testimonial match in October 1976. 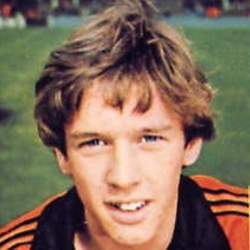 He then made a scoring debut in his first match in major competition at the end of that campaign, against Hearts in April 1977, and made the breakthrough into the first team the following season. Originally playing as a striker, Billy finished as the clubs top scorer during both the 1977/78 and the 1978/79 seasons before dropping back into a midfield position. Having helped United reach their first League Cup final in 1979, scoring twice in the semi-final win over Hamilton, Kirkwood was not involved in the final against Aberdeen at Hampden Park. However, with the match ending goalless and requiring a replay, Billy was back in the starting eleven for the midweek match at Dens Park, collecting a winners medal as the club won their first ever major honour with a 3-0 victory. United reached a second consecutive League Cup Final in 1980, this time against neighbours Dundee. Billy collected another winners’ medal, but remained on the bench as United ran out 3-0 winners to keep the trophy at Tannadice. 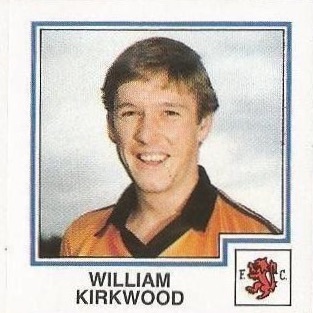 Kirkwood would go on to collect runners-up medals from two other League Cup finals and also two in the Scottish Cup. 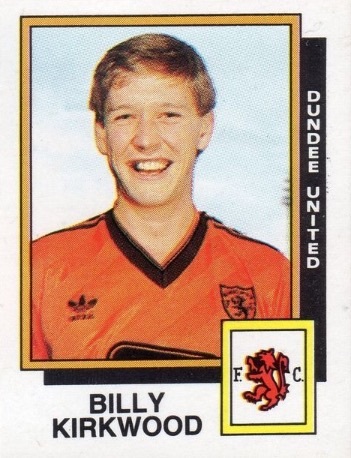 A dependable player who's effectiveness in defence matched his attacking capabilities, Billy was a vital member of the first team squad during the early 1980s, and his versatility was a key element to the United side that won the Scottish League championship at the end of the 1982/83 season. He missed only 5 of United's 36 League matches that year, and played regularly for United in Europe, missing only one match as United reached the UEFA Cup quarter finals in 1982 and 1983, scoring in the famous victories over Monaco, Borussia Monchengladbach and PSV Eindhoven. 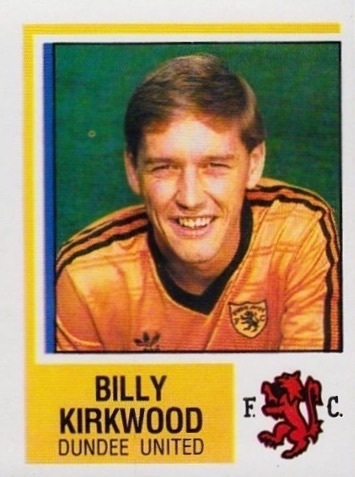 Billy also played in all of United's European Cup matches during the 1983/84 season, as the team were unlucky to lose out on a place in the final to AS Roma in April 1984. 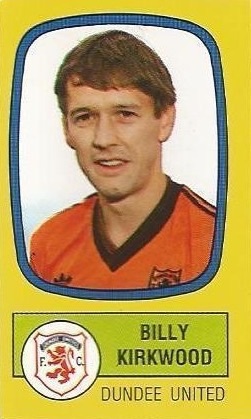 After featuring less and less over the next two seasons, Billy left for Hibernian in a joint deal with Stuart Beedie in the summer of 1986 after ten years with United. 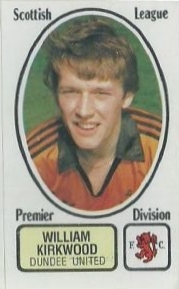 A regular in the Easter Road side, it was a surprise to many when Jim McLean took him back to Tannadice just seven months later for a reported fee of £50,000. Again a vital squad player, he was ineligible for both legs of the renowned victory over Barcelona due to his late signing, but was called upon for the away trip to Germany for United's victory over Borussia Monchengladbach and played in both legs of the historic UEFA Cup Final against Gothenburg. 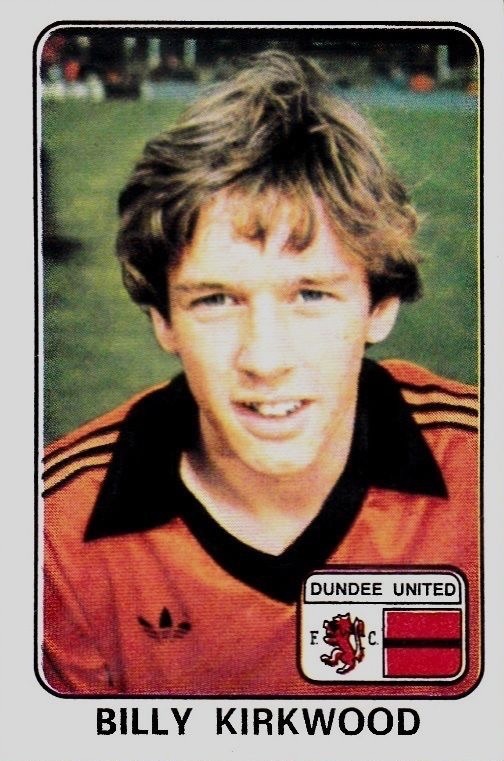 Early the following season, he was transferred to Dunfermline Athletic in September 1987 to try and help the newly promoted club stay in the Premier Division, but before the campaign was over, he once again returned to Tayside, this time to play for Dundee. After just 20 appearances for the Dark Blues, he picked up a pelvic injury in a Scottish Cup tie against United in January 1989, and this eventually lead to his early retirement at the age of 30. 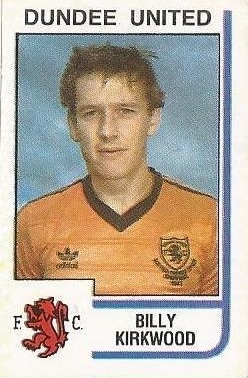 He took up a coaching role at Dens Park, and moved on to Ibrox when Walter Smith became Rangers manager in 1991. Four years later he returned to Tannadice for a third time, taking his first managerial position as United battled relegation in March 1995. Fourteenth in the list of total appearances for the club, Kirkwood was inducted into the Dundee United Hall of Fame in 2012. Billy was born on this date in Edinburgh.